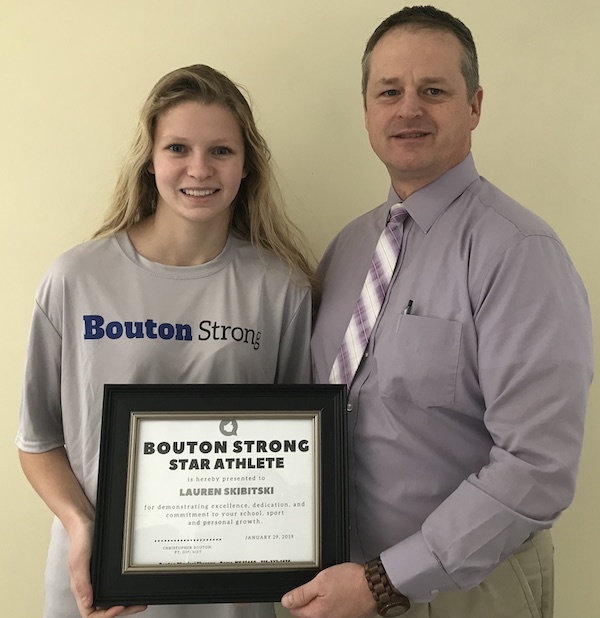 Bouton Physical Therapy is excited to announce the addition of the 'Bouton Strong Star Athlete' of the week award, recognizing student athletes in local school districts for their dedication and commitment to themselves, their team mates and school. We have reached out to all athletic directors who have agreed with the help of their coaching staff to assist us by nominating new athletes each week who excel in their particular sport. An athlete will be chosen each week and celebrated with a certificate presentation in our clinic, a goodie bag, is profiled on our social media channels and website and is entered in to receive the Bouton Physical Therapy $500 scholarship at the end of the school year. 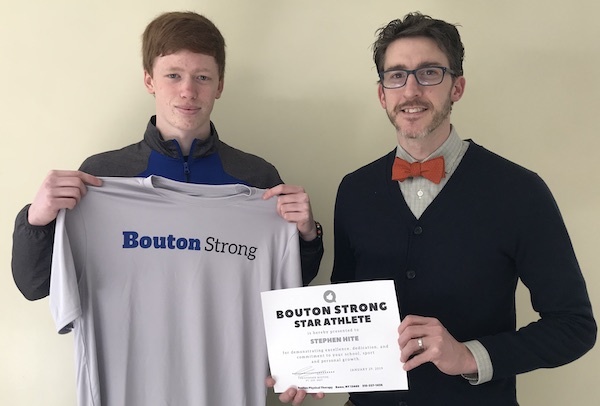 Please join us in congratulating Stephen Hite, a Junior at Camden as this weeks 'Bouton Strong Star Athlete' of the week recipient. The athletic director, Aaron Fiorini of Camden nominated Stephen for "bowling a 300 game at the TVL Championships as a first year bowler." Stephen is also an avid football baseball player, track and field and cross country runner, alpine skier and golfer. Stephen has received the scholar athlete award, perfect attendance award and academic reward. Stephen will be attending MVCC as a career firefighter. 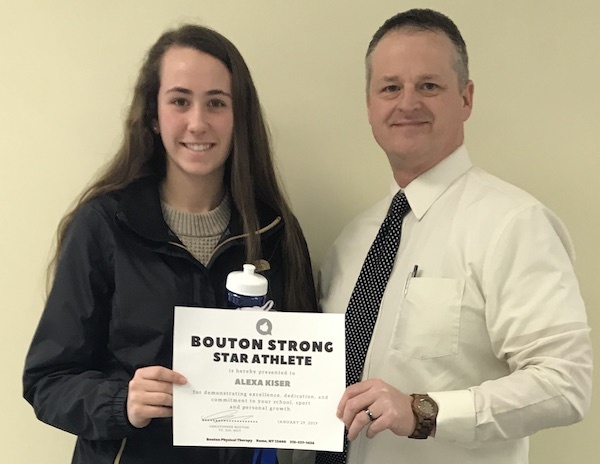 Please join us in congratulating Alexa Kiser, a senior at VVS as this weeks 'Bouton Strong Star Athlete' of the week recipient. The athletic director, Randy Thomas of VVS nominated Alexa for her achievements in Soccer and Basketball as "she has been the captain of both teams for the last 3 years. Alexa was selected as the Mohawk Valley All Star in soccer and scored her 1,000th point in basketball this year and is currently 5th in the section in points with 296 in the first 16 games. Alexa continues to be a positive role model for all of the younger players." Alexa received the Junior Athlete of the year in 2017, Soccer MVP 2018 and 2019, Basketball MVP 2017 and 2018, and the Soccer and Basketball 1st Team All Star Mohawk Valley 2017 and 2018. Please join is in congratulating Lauren Skibitski, a senior at Oneida High School as this weeks 'Bouton Strong Star Athlete' of the week recipient. The athletic Director, Stacey Tice of Oneida nominated Lauren for her achievements in Basketball as "she scored her 100th point in a game against Marcellus this week and as a leader of her team who also dominates as a rebounder and strong defender." Lauren is also an avid tennis and softball player receiving many additional accolades including being selected as the All-Mohawk Valley Athlete by Uticaod.com and All-CNY Athlete by Syracuse.com and All-State Athlete by NYSSWA. Lauren is planning to attend Albany College of Pharmacy or St. John Fisher for Pharmacology. 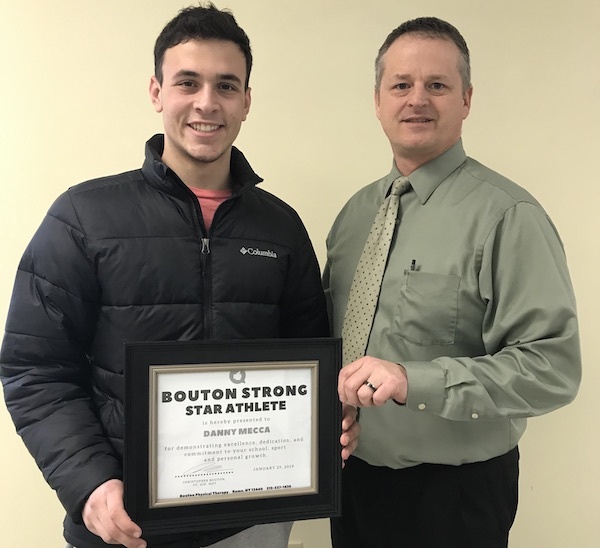 Please join us in congratulating Danny Mecca, a Senior at Rome Free Academy as this weeks 'Bouton Strong Star Athlete' of the week recipient. Jason Nowicki, the Rome City School District Hockey Coach nominated Danny for "his goal and assist against Baldwinsville on January 15th in a 4-1 win. On January 18th against Fulton he had a goal in a 4-1 win. On January 23rd against CNS he had 3 goals in a 5-4 win and he scored the game winning goal in that game." Danny is also an avid football and baseball player and has been recognized as the 2018 Mohawk Valley Comeback Athlete of the Year, as a player on the 2018 All Mohawk Valley ice hockey team, a 2018 & 2019 Section 3 - 1st Team Division I All Star and a 2018 All CNY ice hockey team player. Danny is considering attending SUNY Geneseo to major in business in the fall.